In that famous Pema Chodrom quote that everyone knows, she explains that “nothing ever goes away until it has taught you what you need to know.” And yet so many times in our lives, we tend to wonder why something is happening to us again and again. As though luck throws us the same problems and it’s all due to chance. Yesterday officially marked the date of one year ago that I signed divorce documents. By the time a judge stamped it, the calendar read April, so I never know which date to recognize. But yesterday marked the signing which seems more official than the state-mandated official date for some reason. You can look back at this journal and see the ways I have changed, the ways my entire life has changed. I was driving home from the grocery store this weekend and listening to the latest Dear Sugar, and this week’s guest noted a passage from an Edith Wharton letter when she stated that the cure for loneliness is “to make one’s center of life inside oneself, not selfishly or exceedingly, but with a kind of unassailable serenity — to decorate one’s inner house so richly that one is content there, glad to welcome anyone who wants to come and stay, but happy all the same when one is inevitably alone.” It resonated so much that I smiled and laughed in a way that was so genuine and so loud that it would have been embarrassing had someone been in the car with me. That “unassailable serenity” was such a foreign concept to me when I shakily signed those documents a year ago. I get it now. I am finally at a place when I whisper thank you, thank you, thank you at least once a day for the life I lead. For being alone and free and no longer tied to anyone who does not understand me and see me for who I really am. It took me a really long time – the better part of the past year – to come to terms with this, to be able to say it aloud. You grow so used to how someone treats you, what they do or don’t recognize about you, that you neglect to see the writing on the wall. You don’t even recognize that love isn’t being served at the table anymore until that concept walks through the door in a body ten years younger than yours and leaves with your wedding china. The universe speaks to us in whispers, and when we don’t listen, we get a scream. If there’s a path you are not meant to be on, God will find a way to place you on another road. Sometimes it just takes a drastic measure to get your attention. I’m listening now. I see it. I hear it. I’m better for it. Marriage is a beautiful thing when it is done well and two thinking and feeling people show mutual respect for one another, but as the host on Dear Sugar said last night (even as the happily married man that he is), there is a very small circle drawn around what you can do when you are married, even happily so. I’m finally understanding that circle became even smaller and smaller for me with the passage of time, and it is nothing but relief as I emerge from it a year later. Grateful and hopeful and stronger for the pain. These simple, obvious things – the freedom to make decisions without consulting anyone, the freedom to take my time as I move forward and choose someone else to spend time with, the freedom to pursue my own interests and not have to explain myself to anyone else – these little things feel so unbelievably cherished and special to me in my present season. Like I can finally breathe after years of swimming underwater. Still though, there are bits that remain. Lessons that, to reference Chodron’s quote again, just aren’t finished with me yet. 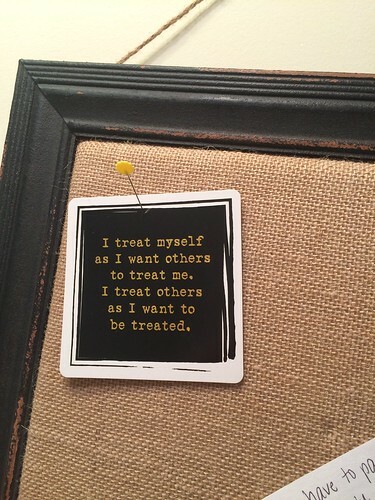 Every week, I flip a new card from my affirmation deck on Sundays and pin it on a board near my bathroom mirror. Sometimes it feels like that particular card found me on that particular day. It often works together with the rest of my life to drive that message in my head so that as I read it each morning, it becomes clearer and clearer. We all know the Golden Rule to love one another, but the part we forget is to love ourselves. To treat ourselves how we’d want to be treated. To respect ourselves. This week that idea was finally a lightbulb moment for me. The simplest of concepts that I should have accepted many years ago, but I am just now figuring it out: You show people how to treat you. If someone repeatedly steps in my personal space or pierces my own sense of worthiness, it is not his responsibility to fix that. It is mine. As I look back on my life as a married woman, I can now see so clearly that an affair did not come out of nowhere. I taught him how to treat me. Every time we swallow an insult or accept something that bothers our spirit and insults our deepest sensibilities, we tell that person that it’s okay to treat us that way. I’m seeing this now – looking back at the hundreds of times I absorbed something as my lot in life, what I had to accept. When in reality, I didn’t have to accept it, but it was simply laying the groundwork for what was to come. I felt shocked when it all dissolved in such an explosion, but in actuality, it was the most logical next step on the journey. The universe whispered, and I ignored it, but then it screams so loudly that you can’t run the other way. My therapist has noted (another concept that never dawned on me but is incredibly obvious) that I don’t permit myself to feel anger and I essentially skipped over the anger stage of the grief process in this past year of my life. She’s right. Denial, shock, sadness – I did all of those. Anger? It never emerged. My friends would comment on how they were angrier than I was about it, and they were right. How I never saw I was skipping that and why I never let myself feel it is something I don’t understand. But I know for certain that the world gives you what you need to learn when you are finally ready to work through it. Anger has a purpose. It puts that fire in your belly that grants you the resolve to demand respect. I think I’m finally there. I’m reaching a place where I can recognize when someone is not respecting me, and I’m finally learning to establish boundaries. “No” is a complete sentence. I read once that you really know you have forgiven someone when you can say thank you for the lesson he taught you. I’m not certain that I have arrived at full forgiveness, as expected only one year out. That notion takes years and years to fully develop. But I’m not certain it’s a straight line either because the thank you part is where it begins for me, not where it ends. It’s hard to correct these things after years without boundaries, but it’s easy for me to grasp this moving forward. I can say no without apology now. And most importantly, I can see those red flags now. When I set a boundary or explain that something hurts my feelings and causes me pain and someone disregards that feeling or dismisses it, or worse yet insults it by calling me too sensitive, it is a sign to run the other way. Why do women forget this? We neglect to realize that we can decide when something is unacceptable – whether that’s in personal or professional life. Our plates are too full and our minds are preoccupied with the thousand ways we should do everything better when in reality the only thing we can do better is to recognize where we end and where another person begins. Katie, my earlier years were very similar to your life with your ex. I was unclear on how to set boundaries and how to be treated for almost thirty years. It took me that long to realize what a part I play in the way others treat me. My husband actually had a lot to do with helping me realize this, too. I didn’t spend 10 years in a bad marriage, but I spent even longer accepting awful treatment from men – and from friends. When I finally began waking up and realizing that I was stronger on my own than with someone who didn’t appreciate me, my world filled in with color. Old friends and family were more and more surprised and even shocked that I began to stand up for myself and not put up with people’s b.s. It’s a process for sure. Such a simple concept, but it takes a while to get there. I love this post so much. You have so many people in your corner cheering you on! All marriages take communication and commitment to make it work. My parents have been happily married for 25 years but there were plenty of times throughout their marriage where they were on the brink of a divorce. My parents worked it through with a lot of communication and hard work and sometimes that’s all you need to make a marriage work. If your ex was unhappy in the marriage he should have expressed his problems instead of breaking his vows and jumping to another women who gave him “new boxes” on an answer sheet. Those “boxes” sometimes don’t even belong in the answer sheet in first place which is why he never saw them. If he can’t learn to communicate with his partner then chances are his relationship with his mistress will fail as well. Honestly I have read many divorce cases and how spouses end up leaving for another after DECADES of marriage. I find it unhealthy when someone leaves their partner for someone else because they are not giving themselves an opportunity to learn from a failed relationship and pick up the do’s and don’t’s. Katie you are strong and I am sure that you will carry these learning experiences from your failed marriage in your next relationship. You have new expectations and boundaries and you will find your right match in the future. Your ex will likely carry the same mistakes he made in his previous marriage onto his next one. Not only that but if your ex has conscience then he will always carry the guilt of cheating. He will always live with the guilt that once his kids grow up and understand his actions towards their mother, they will see him in a different light.